It is the most important time of the year! Grand Final week. But it isn’t without its difficulties this week, so let’s jump in and see if we can Scramble our way to a victory and hold that silverware aloft!! Wow, here we are, the final week in the season. It seems to come around quicker each and every year. But here it is. Our Grand Final week has finally arrived. With a bit of luck and some great preparation you are playing off in one of your leagues for the win. This is the big one. No time for second guessing yourself now. You have gotten this far and it is time to bring home glory… just like Calvin plans to! But, it isn’t all plain sailing through the finish line. We have a suspension, a couple of injuries and other selection issues to deal with as usual. So, let’s get straight into it and see what we can do about getting the win. As I sat in the stands last Saturday night and saw Sloane clunk Ebert in the head my first thought was… bloody hell, this could be trouble for young Rory. And despite all the speculation and commentary around it and comparing it to other incidents, he copped a week for it (I’m not saying it was the right or wrong decision by the MRP, just reporting the facts). For a few weeks now, anyone that has asked me who they should bring in for their midfield has been getting the same answer and each and every time it was Rory Sloane. This was based on their great run home and the fact he has been scoring quite well. And just to show that I practice what I preach, I have to trade him out in RDT and SC (this will take up the only trade in SC that I have left!). So, the next thing we need to do now is work out who we trade him for. Now if you listened to the boys on the Traders Podcast this week you would have heard who Roy and Calvin thought were likely to be the best scorers this week. Their selections were Rocky (that was a surprise hey! ), Lachie Neale and Luke Parker. So given all we care about this week is getting as many points as we possibly can, we should just be looking for the best option available! Personally I agree with these selections as they are the ones that I was looking at when I was replacing him in my teams. It wasn’t good hearing the news that Nic Nat was going to be out with an ACL. We never want to see our stars of the game getting injured, particularly those that are as exciting as Nic. Now if you had brought him in after he returned from injury a few weeks back now, you are probably only doing this in AFL Fantasy where you thankfully have two trades to play with this week. No matter the format, I think that if I had to bring in another ruck for him this week I would certainly be looking at Brodie Grundy. He has been in fantastic form for the Pies and is scoring really well. On top of that he comes up against the Hawks who are without Jonathan Ceglar who is also out with a knee from the same game. Grundy will still have to deal with McEvoy, but should be able to continue his great scoring run. If you are a Lycett owner you would have been relieved to see that he is still in the side this week. If he is a late out you will at least be able to make a change given they are the Friday night game. He will be up against Jacobs, but as number one ruck he has been good this year. Well the first thing here is… use all your trades. Now some of you might say that you have a perfect team and all but one of you is lying. The only one with that is the guy on top of the overall rankings. Even then it may not be perfect for this upcoming round. Even if you don’t have to make any on field changes, you could use your trades to strengthen up your bench. But seriously I would be surprised if there isn’t a move you could make to strengthen your on field players. Particularly in AF where we know we have two trades (as you may have already run out in the other formats) you can still do a downgrade/upgrade this week to boost one of your players. Look at matchups, look at their recent form and their recent form against their opponent this week. Also have a look at the teams that have been giving up heaps of points, if he is playing one of them then bring him in. If you are in a matchup that looks a little dicey for you there are a couple of things that I would be doing to try and get the win. Have a look at what you perceive to be their strengths. See who they have that you think that none of your players can match. At this point you can take one of two strategies. You could trade out one of your players that you don’t have as much faith in to bring in the player they have to negate the advantage. Or you can stick with your guy or bring in someone else unique that you think can get the job done. If you are predicted to be massively losing the match you may be best served going for the guy that is unique. If they have Rocky and you don’t and you bring him in and he (god forbid) get’s injured early like Swanny did then you are still stuffed. But if you had brought in a unique which might be Neale, then you have the advantage over your opponent. Go for a unique captain selection. Have a look at your opponent to see who you think their captain will be and then check Calvin’s Captains (as if you haven’t done that already right?) to see what the options are. So if they have Danger and you have Danger and Rocky, consider going Rocky instead of matching their Danger. Once again if you are looking like losing you may as well have a crack at a unique. IN SC ONLY. Look at who you can loophole for both Emergency scores and VC/C choices. Most astute Supercoach players do this every week. All I will say is, if you aren’t sure how to do it or aren’t confident then don’t! But if you know what you are doing then give it a go, it might help out. If you had done it with Josh Smith last week you would have been loving life! If you are to do it though, work through all the moves you need to make over the weekend to make it work. Just to be doubly sure that you have the necessary non playing guys to be able to do it and the sequence of games will allow it. It was pretty uneventful at the Selection Table this week. Menadue was dropped (they probably did anyone considering playing him a favour). Jimmy Bartel returns which wasn’t really a surprise to us. Kerridge and Silvagni return for the Blues which will certainly assist a lot of teams. Kerridge could be a real option given he plays the Bombers this week. Were you planning on relying on Orazio Fantasia? Hopefully not, but if you were he is gone with a groin. You shouldn’t be relying on someone like him in a GF anyway. One person we did lose is Sam Collins. He has been bench cover for us for a number of weeks. But you have to find another way to cover the back line now. Hopefully you weren’t relying on him on your field! The other thing that I would be making sure of is that I had cover on all lines. Particularly up forward if you have Buddy. He is a real risk to be a late out this week I think. Triple check your team. Don’t let inattention stuff up your GF! Don’t overthink things and outsmart yourself! Your instinct has gotten you this far. It might just help you finish the job. Check out Calvin’s Captains and nail that captain selection! Do some research. If you are going to make some trades, check out what the guys you brought in scored last time they played their current opponent. Stay GLUED to social media today. Just in case there is a late out. Buddy and Boyd are the biggest risks in these stakes from what I can tell. And that brings me to the end of the season of Friday Scrambling. 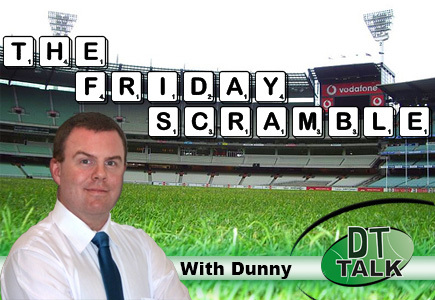 It has been an absolute pleasure bringing this to you each Friday. Hopefully I have been able to give you some good advice along the way and it has helped you get to the GF and with a bit of luck the win this week. One of the things I love seeing is all of the help you readers give each other on Friday’s when I can’t jump into the comments. Just want to give a big thank you to everyone that has asked questions throughout the season and if I didn’t get to yours I am sorry. Also thanks to Warnie, Roy and Calvin for another great season and allowing me to be a part of DTTalk, I really enjoy bringing you this each week and it is because of them that I am able to do it. Good luck to all in the GF! I’m trying to finish in the top 100 for the first time (currently 94th). Which one gets me more points this week? Goodluck! Nice ranking, I’m currently clinging to a rank in the 300’s, hopefully I can improve a bit this week. Tough call, I would say 2. Neale has dominated in the big derby games in the past so I think he’ll do the same. But I’m not a fan of Houli, has burnt me in the past. think JJ would be more points v Houli. Houli to JJ for sure – Tigers will be completely massacred by the Swans and Houli’s just not reliable anyway. Another option worth considering is Hodge – should run amok vs Pies. Your two weakest spots are Williams and Blicavs. Is there a trade you can do involving both of them? Must trade Collins – do NOT leave yourself without emergency cover! Blicavs to Grundy is best 2nd trade option – Blics probably won’t score big this week but Grundy will. And even if Buddy is a late out you still have Silvagni to cover – who knows, he may go quite well vs the Dons. Good luck! need to get rid of Sloane but can’t afford to get Parker (as I’m using my other trade to upgrade Vince to JJ). Sloane –> Hunter a good move? I can also afford Treloar. even with the bulldogs playing freo? Who should I trade Vince or Guthrie? Dangerfield to Menegola and Naismith to Grundy??? Think Dahlhaus will go big against freo ? Zac Williams to Simpson, or Menegola to Voldt? Do we risk keeping Neale or trade him ?